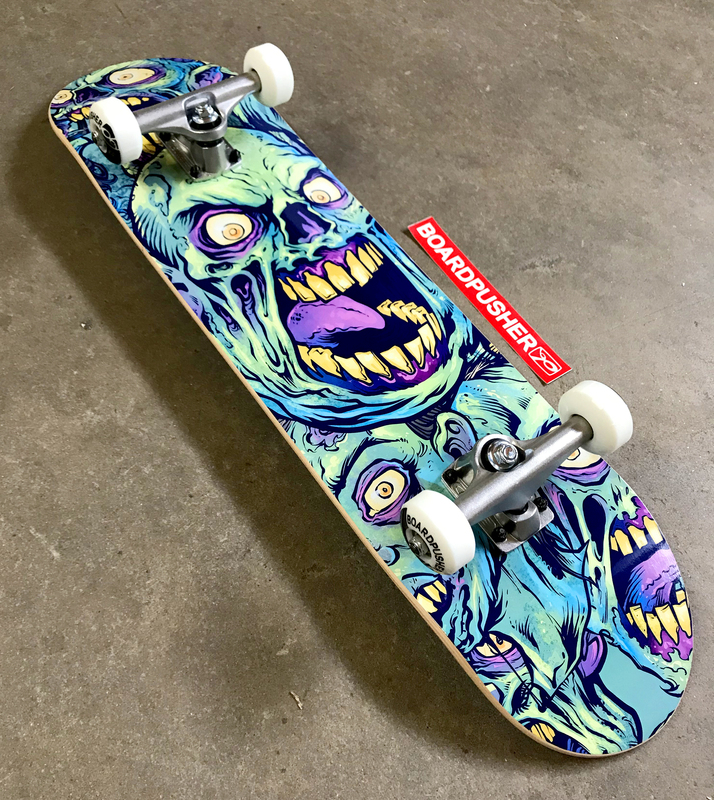 Today’s Featured Deck is this “Zombie Pattern” created by Brian Allen of Flyland Designs and was completed with the BoardPusher.com basic components package. Brian has made this and several of his other graphics available as customizable backgrounds. 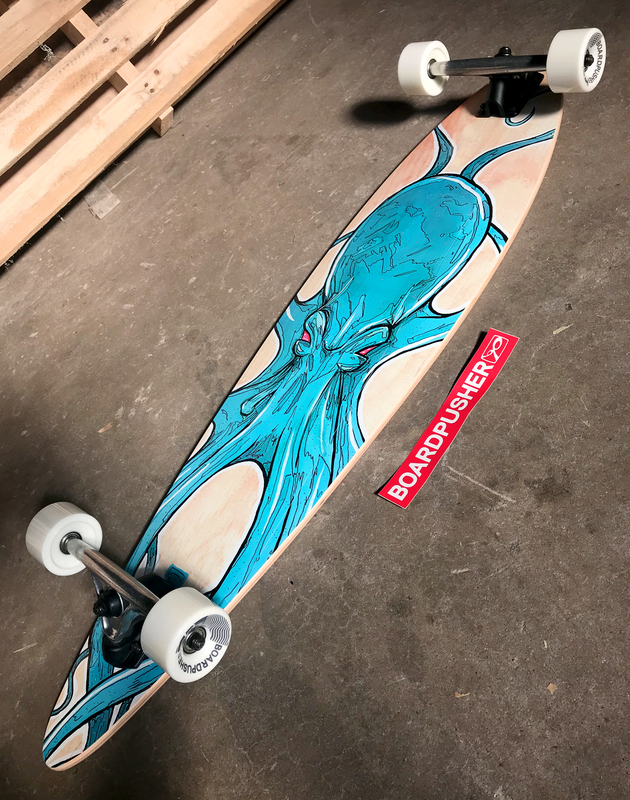 Check out his website flylanddesigns.com, follow him on Instagram @flylanddesigns_brian_allen, and view his other skateboard designs at BoardPusher.com/shop/flylanddesigns. Design your own graphic and then add trucks, wheels, etc. to make it a custom complete skateboard at BoardPusher.com. 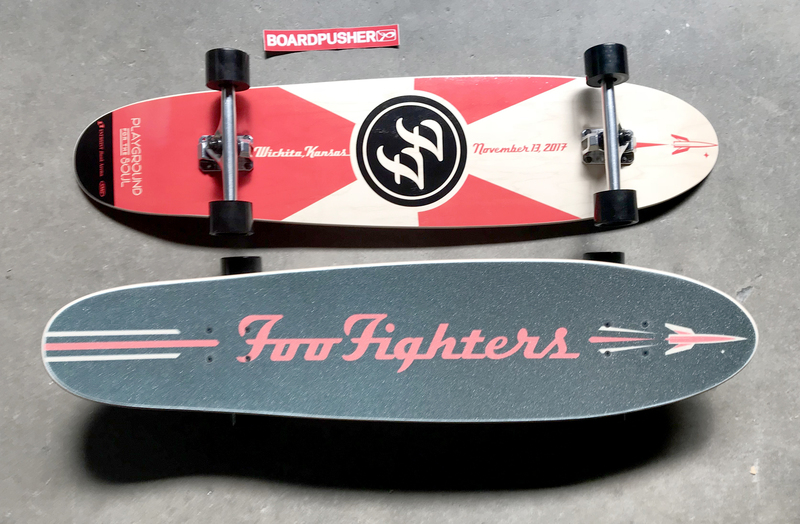 The folks over at INTRUST Bank Arena in Wichita, KS created these custom longboard and custom griptape graphics and completed them with OJ Hot Juice Wheels and Luxe Trucks as gifts for the Foo Fighters when they played the arena on their Concrete and Gold Tour. It’s pretty cool to think Dave Grohl and co. are riding around on some custom BoardPusher.com longboards. Make your BoardPusher.com complete a truly customized skateboard with your own griptape graphic. 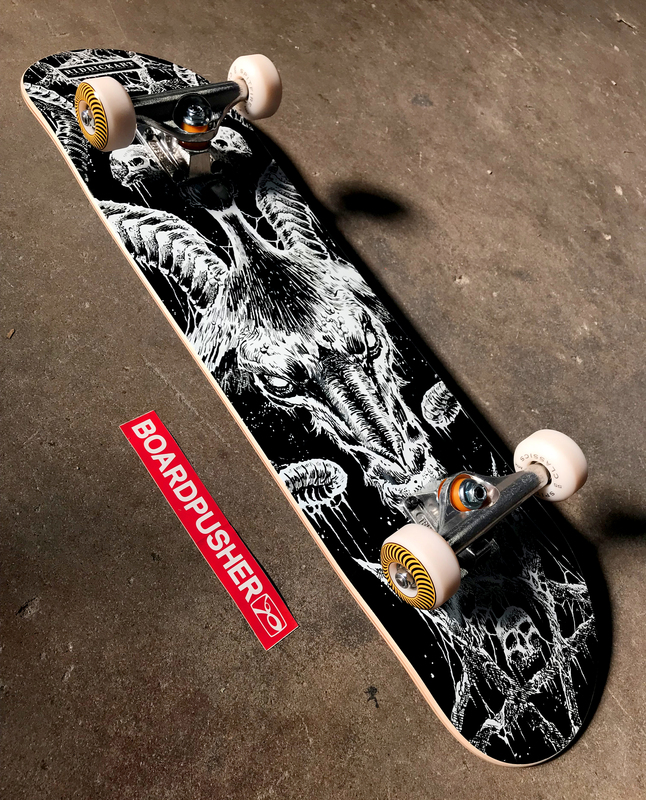 Today’s mini-cruiser complete skateboard Featured Deck was designed by Swedish artist Felix Harrison for the vape distributor Smokeless Smoking. The custom skateboard graphic is promoting a snow cone flavored e-liquid they produce. Find out more at smokelesssmoking.com or view Felix Harrison’s work at grossmotion.com. 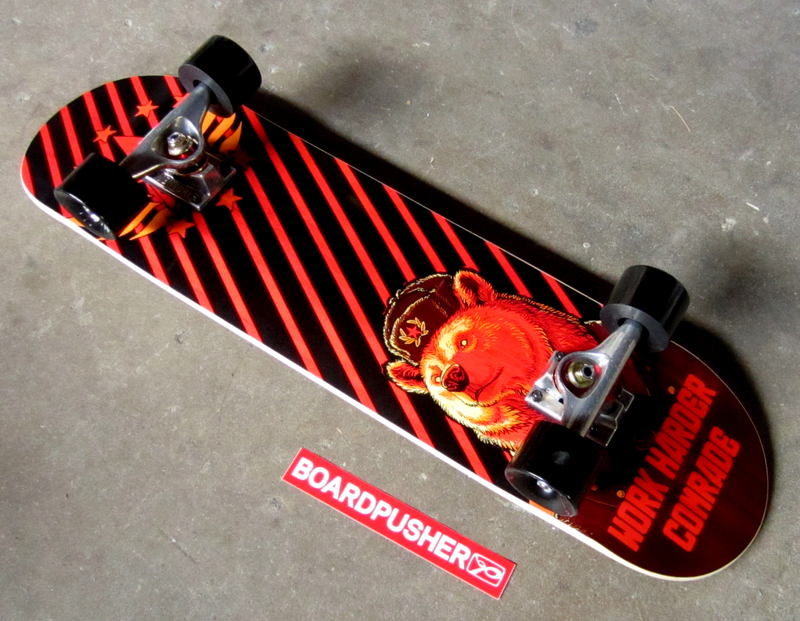 Promote your brand with a custom skateboard graphic you create at BoardPusher.com. 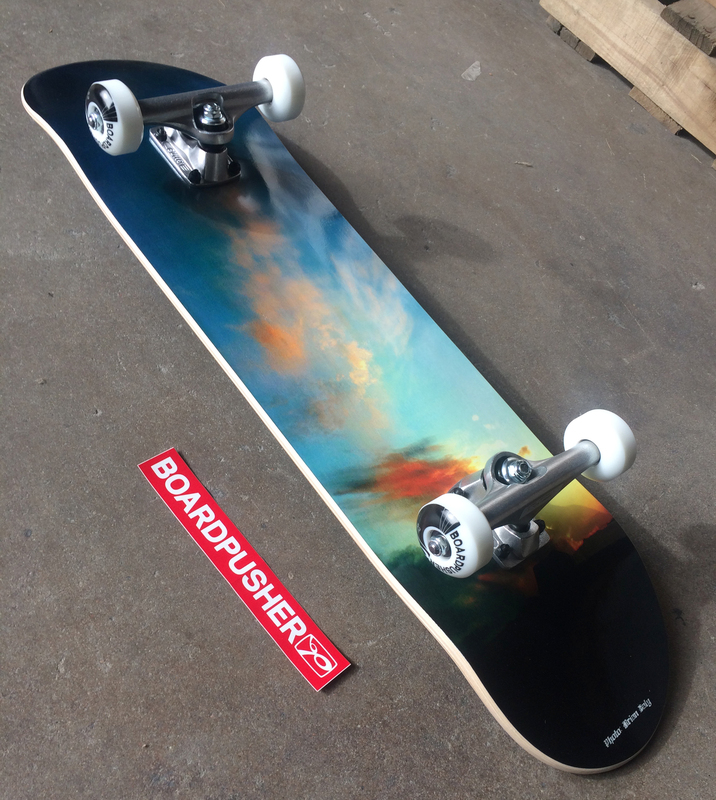 For today’s BoardPusher.com Featured Deck we have a graphic created using a photograph of a dusk sky taken by Brian Daly. This skateboard was made complete with our basic components package including BoardPusher wheels and Bullet trucks. Brian has more night time photography skateboard designs for sale at BoardPusher.com/shop/ShinKicker. 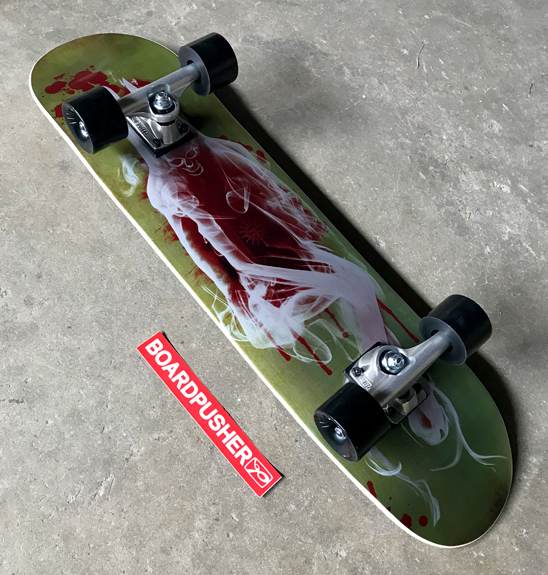 Add trucks and wheels to your BoardPusher.com custom designed skateboard by checking the Make Complete box before checkout. One of the latest shops added to BoardPusher.com is Funny Fuse with skateboard graphics created by Canadian artist Alan Funk, so we decided to make one of his designs this week’s Featured Deck. 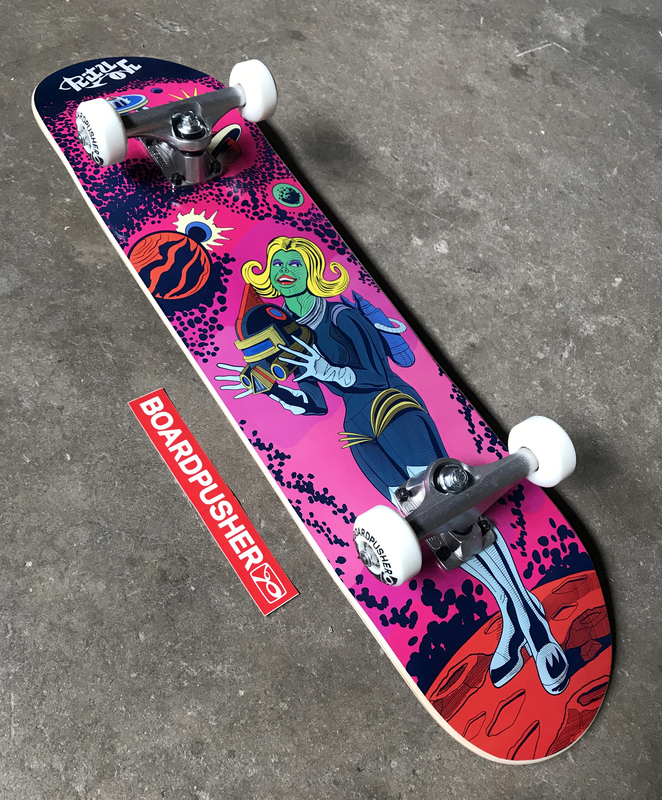 “Ritu Oh Space Girl” was also completed with our basic complete components package, including BoardPusher.com 53mm wheels and Bullet Trucks. Head over to BoardPusher.com/shop/funny_fuse to see more of Alan’s graphics. Upload your own design, choose a custom background to help create a personalized deck, or shop for a custom skateboard graphic from one of our hundreds of independent artists and make it a complete by selecting the basic components package or upgrade your trucks and wheels all on BoardPusher.com. Summer’s nice, but we all know the perfect skateboarding weather is approaching. Roll into the season on a fresh new graphic you created and update your hardware or hook up a newbie with their first complete skateboard they designed themselves during our Labor Day Sale. 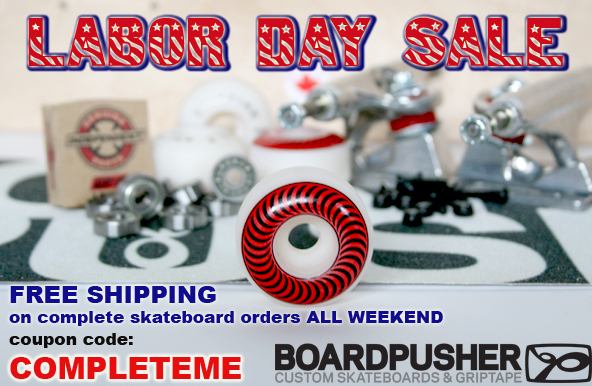 Throughout the entire long weekend we’re offering *free shipping on all custom BoardPusher.com complete skateboard orders. With basic packages starting at $55, you can also choose from an assortment of trucks including Venture and Indy and throw on a set of Spitfire, Survey, or even some big ol’ cruiser wheels. Mix and match your components however you like, just make sure you use coupon code COMPLETEME before checkout to claim your discount. *HI, AK, international, and express orders will receive $10 off shipping. Offer not valid on bulk orders. Featured Deck of the Week: “The Medved” by Riley H.
Perhaps this week’s Featured Deck will serve as a snapshot in history. “The Medved”, meaning the bear in Russian, was created by Riley H. The design was inspired by the Soviet Union and features a crossed sickle and hammer as well as a large bear brandishing a Soviet uniform urging the rider to “Work harder Comrade”. The skateboard was completed with Venture Trucks, OJ Hot Juice Wheels, and Dooks Riser Pads. Check out more of Riley’s work at inductivegnome.deviantart.com. 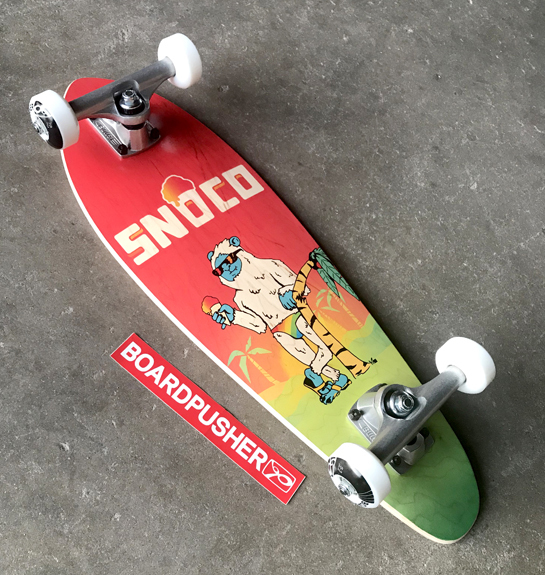 Pick your own truck and wheel combinations and make your custom skateboard a complete on BoardPusher.com.